Pulse Nigeria will be hosting two masterclass sessions at this year’s Social Media Week Lagos. The events, “How Digital video is changing us” which is scheduled for the 28th of February by 1:30 PM, and “The Rise of Podcasts: The New FM” which is scheduled for 27th by 4:30 PM will hold at SMW Studio and The innovation stage respectively. Speakers at the events will include include Aniekan Etuhube, MD Pulse TV; Tunde Kara, Director of Sales & Business Development Pulse NG; and Sisi Yemmie, Vlogger & Media Personality with Princess Abumere moderating for “How Digital video is changing us”. Other speakers at the sessions will include Osagie Alonge, MD/Editor-in-Chief Pulse NG; Princess Abumere, Entertainment Editor Pulse NG; and Andre Blaze, Multimedia personality with Dami Elebe of Beat FM moderating for “The Rise of Podcasts: The New FM”. 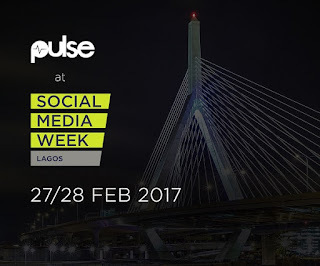 Social Media Week Lagosis a week long conference that providesthe ideas, trends, insights and inspiration to help people and businesses understand how to achieve more in a hyper-connected world. The event features a central stage for keynotes and panels, multiple rooms for workshops, masterclasses and presentations, and an area dedicated to co-working, networking and interactive installations. According to the organizers, “The mission is to help people and organizations connect through collaboration, learning and the sharing of ideas and information”. Pulse NG is Nigeria's new media publisher. 24/7 live news & videos, entertainment, politics, sports, lifestyle, celebrities & more!